>Yo! My Saturday has gone by way too fast. I still have a million things to do this weekend! One of the things on my to-do list is to work on the blog. It needs some pizazz. I’ve been working on both design and content changes…but I’m still undecided on some things. Stay tuned! 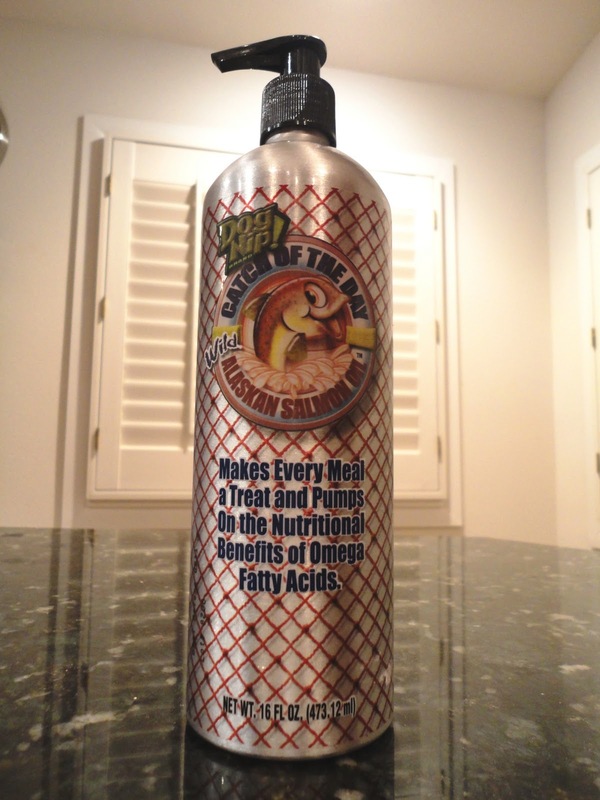 Today’s review is on Dog Nip’s Catch of the Day Alaska Salmon Oil. Whew. That’s a mouthful. Dog Nip’s Catch of the Day has a lot of cool products. Check them all out at Free Range Dog Chews. In fact, one of TLB’s all-time favorite treats is their Stuffed Salmon Skin Knotted Bones with Sweet Potato. And yes, they do smell quite fishy. There are a few different companies that sell salmon oil. In general, for a 16 oz bottle like this one, they are going to cost somewhere between $13 and $20. 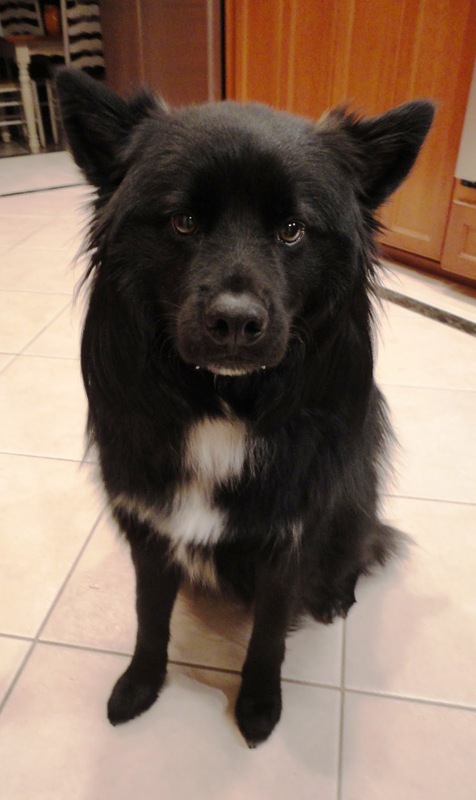 Salmon oil is good for dogs because it is high in Omega 3 fatty acids. This translates to a healthier coat and better skin. It doesn’t hurt that most dogs (and cats!) love the taste of salmon. COTD’s Alaskan Salmon Oil has just two ingredients – salmon oil and rosemary extract, which is known to prevent cancer. Because COTD’s Alaskan Salmon Oil is on the expensive side, TLB only gets it every other day. As you know, I mix lots of other yummies into his dry food on non-salmon oil days, so that way every different product is a special treat! 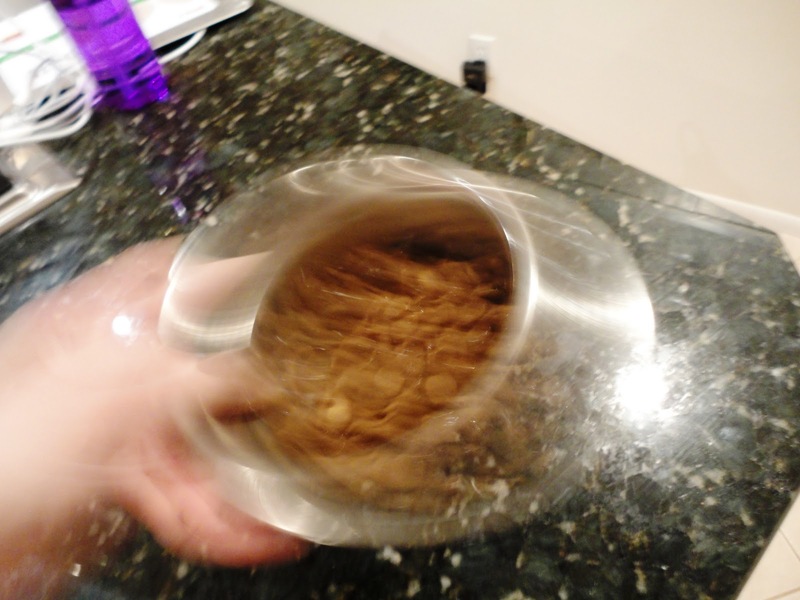 I start with TLB’s bowl of dry food. 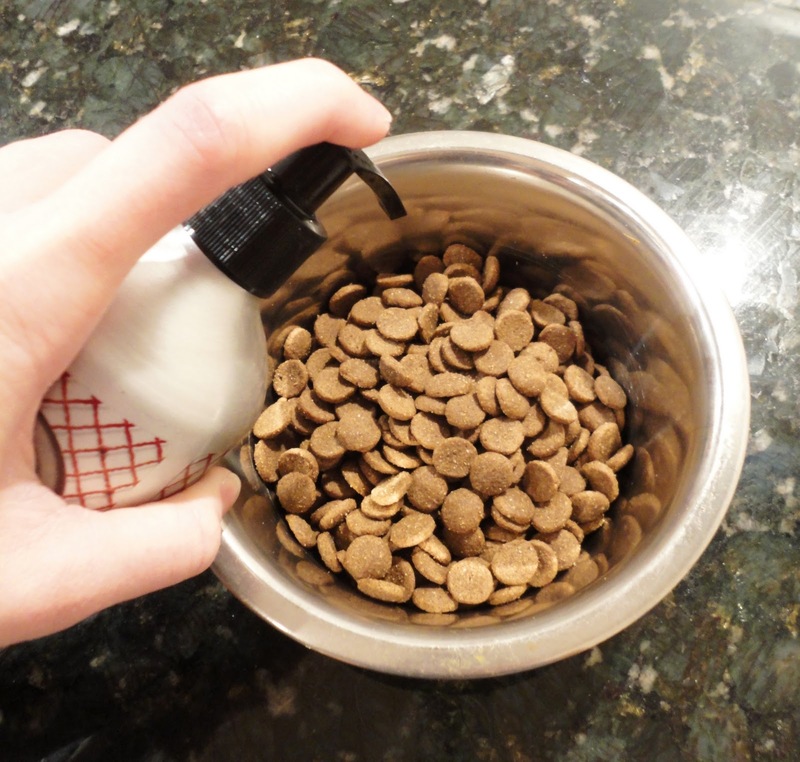 It’s best to keep salmon oil in the fridge, and I find that this is true of a lot of dog treats (especially sweet potato chews). 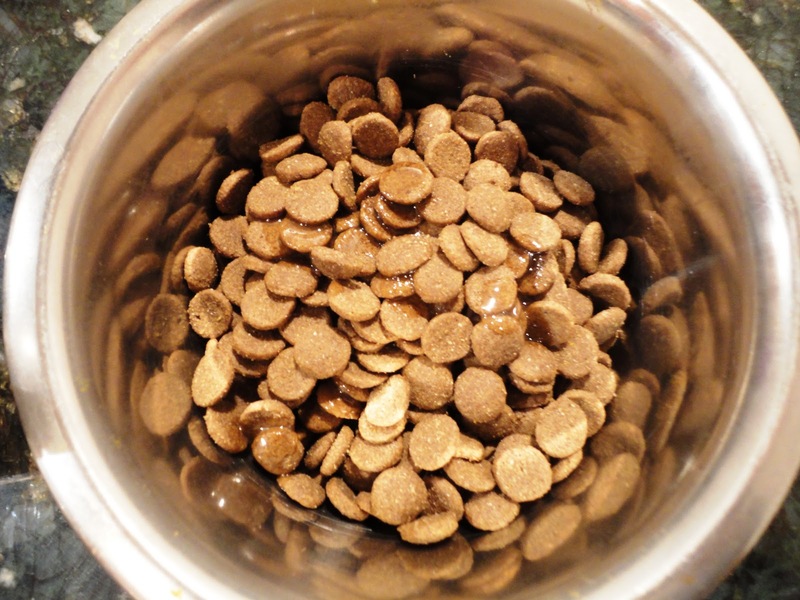 If your dog gets a variety of treats, why not pop them in the fridge? They’ll keep longer and the cold will make them nice and crunchy. Of course, if you have a dog with sensitive teeth, this may not be the best idea. Since TLB is about 32 lbs, he gets three pumps of salmon oil. While he patiently waits (please note drool), I swirl his bowl around to mix that delicious oil all up! TLB is down with the salmon oil. 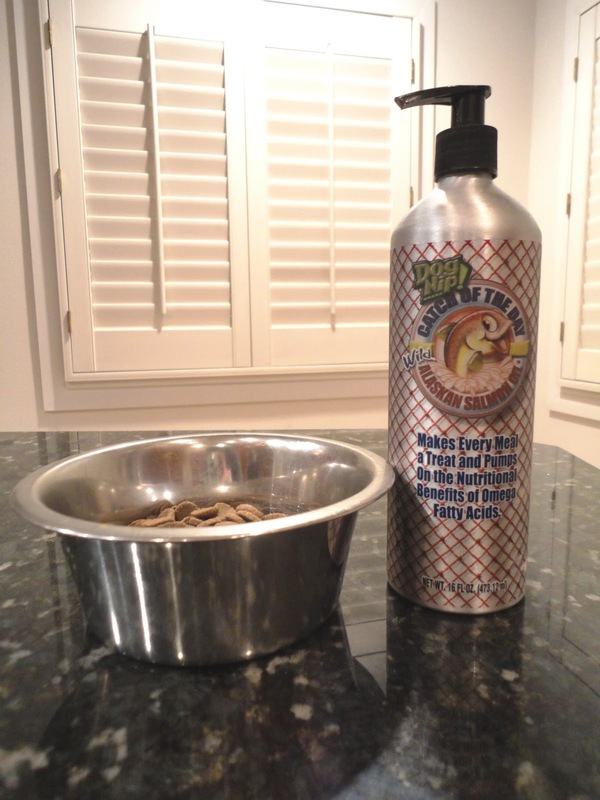 We give Dog Nip’s Catch of the Day Alaskan Salmon Oil a seven out of 10. 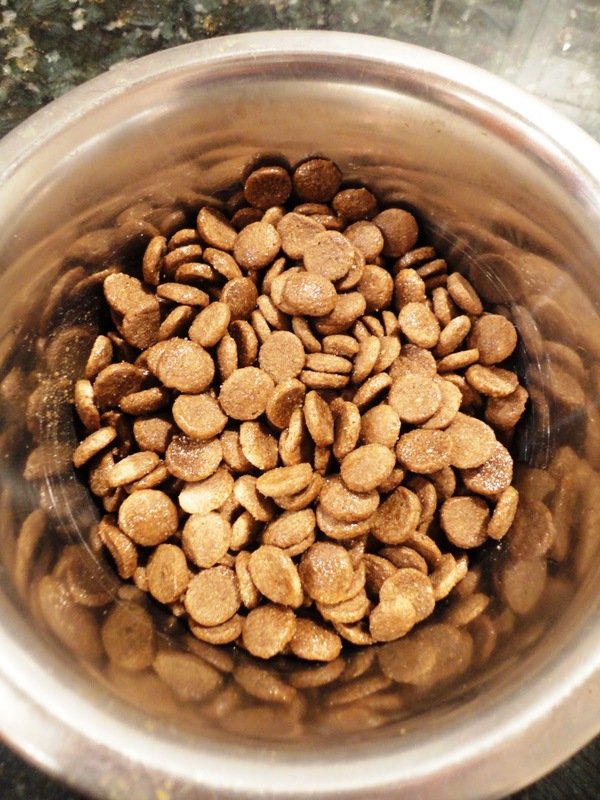 It has minimal ingredients that provide great benefits, it tastes yummy to TLB (and, I’m willing to bet, to most dogs), and it lasts a long time (especially if you use it intermittently with other dry food mix-ins). The one and only downside to this (and any other) salmon oil is the price tag. It’s up to you to decide if it’s worth it. Since we use it sparingly and only three to four times a week, it’s definitely on our must-have list! Posted on January 8, 2011 May 14, 2011 by Shannon	This entry was posted in This 'N' That. Bookmark the permalink.